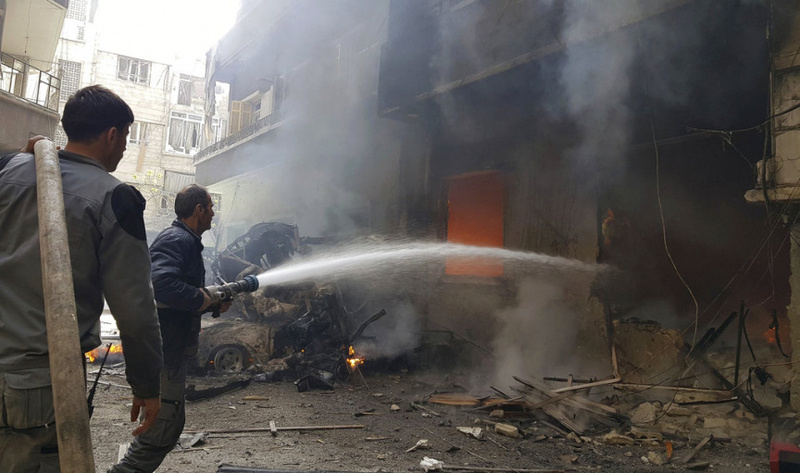 BEIRUT (AP) — Syrian rebels and their families were preparing to leave a besieged town in the eastern Ghouta suburbs of Damascus on Thursday, in a deal that could see the bombed-out town handed over to the government following years of siege. It is the first such arrangement for a town inside the besieged enclave, which has endured more than one month of relentless shelling and bombardment as the government, backed by its ally Russia, pushed to retake the region after seven years of revolt. As rebels prepared to depart the town of Harasta, thousands of civilians streamed out of other areas in eastern Ghouta that were still being bombed by the government. The government's air and ground assault, which escalated Feb. 18, has seen the once sprawling territory at the doors of the capital shrink to three disconnected rebel-held islands. The evacuation by Ahrar al-Sham rebels from Harasta, if it goes through Thursday, could serve as a blueprint for other rebels in other towns, bringing President Bashar Assad's government closer to recapturing the entire territory. The international medical charity Doctors Without Borders said the advancing government forces had captured or destroyed 19 of the 20 hospitals the group was supporting just one week ago. It said medical staff were fleeing the approaching front lines. Rebels hold just 20 percent of the eastern Ghouta territory they held one month ago, according to the Britain-based Syrian Observatory for Human Rights monitoring group. But that territory includes several densely populated residential zones including Douma, the largest town in eastern Ghouta. The Observatory said some 4,000 people evacuated Douma since Wednesday. The Russian military said more than 5,000 people left eastern Ghouta. Rebels and the government exchanged 18 prisoners ahead of the Harasta evacuation, according to pro-government media. The 13 men released by the Syrian rebels identified themselves to the media outside Harasta as soldiers and civilians attached to the Syrian army, who were captured by rebels in the fighting for Harasta. Crying in relief, they thanked God, the Syrian army and President Assad for their freedom. The deal for Harasta will see 1,500 rebels and 6,000 civilians leave to a rebel-held province in northwest Syria, according to the state-affiliated Military Media Center. Monther Fares, a spokesman for the rebel faction Ahrar al-Sham, confirmed that his group's fighters were preparing to depart. Fares said the rebels agreed to leave because of "civilian pressure" resulting from intensive airstrikes and "warplanes that do not leave the sky," adding that residents of Harasta have spent the last three months inside shelters. But the arrangement leaves other fighters for the Failaq al-Rahman group still inside. They government is threatening to move on them if they do not also agree to depart. State-affiliated al-Ikhbariya TV cast the deal as a victory for the country. Its correspondent Rabieh Dibeh said the government would restore its authority over Harasta once the "terrorists" left the town. He said defectors from the army would be ordered to rejoin the service. Critics say it is a formula for displacement that legitimizes the government's brutal siege tactics that have deprived hundreds of thousands of civilians of food and medicines and subjected them to a half-decade of violence. Numerous, top U.N. officials have likened the tactics to war crimes and crimes against humanity. The civilians expected to leave Harasta include family members of rebels and as well as activists and others who do not trust the government's vindictive security services to grant them amnesty. An unknown number of others have already been forced out of their homes or killed in the government's ferocious campaign against eastern Ghouta. Harasta appeared in ruins in a broadcast from al-Ikhbariya, and apartment blocks in the town looked gutted. The United Nations and the International Committee of the Red Cross are not facilitating the evacuations; they will be completed in coordination with the Syrian Arab Red Crescent. The deal is modeled after others that have had rebels surrender swaths of territory around the capital and other major cities to the government. In all cases, the arrangements followed indiscriminate campaigns by the government against hospitals, markets, and other civilian targets, driving thousands of civilians out of their homes. An Associated Press journalist in Damascus, Syria and AP writer Nataliya Vasilyeva in Moscow contributed to this report.